These are very exciting times for The Sorrowful Putto of Prague. Firstly, 2017 will see the first print edition of the comic hit bookstores. As previously mentioned, a Czech edition (Truchlivý amoret pražský) will be released this year by hugely respected Prague based publishers Argo. I’ve spent the past couple of months finalising the design of the book with the hugely talented art team at Argo. The book was originally pencilled in for late 2016, but we decided to hold off to get the book looking exactly as we wanted. I can assure you it will be well worth the wait. Argo are famous for the quality of their book designs and the Putto promises to live up to their high standards. We’ll confirm the print date shortly and hopefully have plenty of previews of the book for people to take a look at. 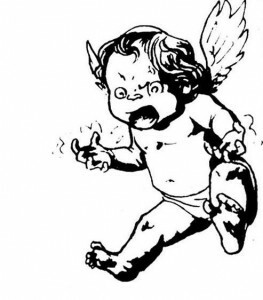 Over the years the online soundtrack to The Putto has gotten lots of positive attention, most notably when The Cure’s Roger O’Donnell kindly provided a superb companion piece to our ‘Disintegratio’ chapter. Play that Fender Jazzmaster, Xavier! To mark our Czech language publication, 2017 will see more music added to the project. In the coming weeks we should be able to announce the first of the new tracks. The first piece even involves yours truly dusting down his old Les Paul, Takemine, Marshall(ova) amp and motley collection of Boss pedals to lay the writing foundation for the first new track. More news to follow. We had some fantastic write ups for The Putto in 2016. We were especially thrilled with a wonderful review from British comic veteran (and a man who wrote many great stories I read in my childhood) John Freeman on his excellent Down The Tubes website. Fingers crossed that 2017 will see even more positive noise bouncing around. We are hoping to press ahead with other print publication plans, most notably trying to secure an English language publisher. As soon as we have any news we’ll be sure to post. Meanwhile, thanks to all of you who have supported the title to date, it’s massively appreciated. If you aren’t already, you can follow us on Twitter, Facebook and Instagram. Any help in spreading the word across those channels is always much appreciated. Here’s to a ‘sorrowful’ 2017.